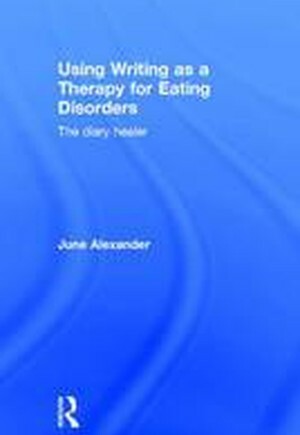 Using Writing as a Therapy for Eating Disorders: The diary healer uses a unique combination of evidence-based research and raw diary excerpts to explain the pitfalls and benefits of diary writing during recovery from an eating disorder. In a time when diary writing remains a largely untapped resource in the health care professions, June Alexander sets out to correct this imbalance, explaining how the diary can inspire, heal and liberate, provide a learning tool for others and help us to understand and cope with life challenges. The book focuses on the power of diary writing, which may serve as a survival tool but become an unintended foe. With guidance, patients who struggle with face-to-face therapy are able to reveal their thoughts through writing and construct a strong sense of self. The effects of family background and the environment are explored, and the therapeutic value of sharing diaries, to better understand illness symptoms and behaviours, is discussed. Using Writing as a Therapy for Eating Disorders will be of interest to those who have recovered or are recovering from eating disorders or any mental illness, as well as therapists, clinicians and others working in the medical and healthcare professions.